Here we are: the end of A Clash of Kings! It’s been a long, often irregular journey over the last year but on the bright side, The Winds of Winter is nowhere in sight! *cries silently into pillow* Before we talk about this chapter, let’s just take a second to reflect on the fact that it is a Bran chapter at all. It’s no big deal to us now, but we should remember that the majority of people reading A Clash of Kings for the first time, Bran and Rickon are supposed to be dead, so reading a Bran chapter at all is a big deal. Yes, yes, there was a metric ton of clues that Theon had not got them but you didn’t know for sure that they were alive until this chapter. 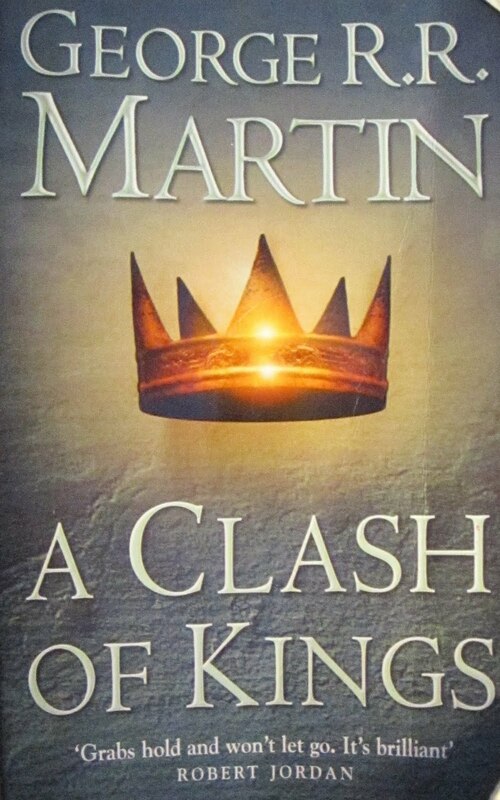 That alone makes it a pretty impactful way of ending the book but it’s also a neat way of closing out the opening salvo of the series; we began in Winterfell before the War of the Five Kings, with the Stark house venturing forth from its dour homeland and we end Clash with the Stark homeland ravaged by war and uncertainty and the Stark castle razed to the ground. Even as Martin provides some hope in the form of Bran and Rickon, he does it while simultaneously showing us the shattered remains of Winterfell. The smoke and ash clouded his eyes, and in the sky he saw a great winged snake whose roar was a river of flame. He bared his teeth, but then the snake was gone. The chapter opens Bran warged into Summer, prowling the smouldering remains of Winterfell. The line above has generated absolutely no shortage of speculation amongst the fans and I would love to hear the opinions of anyone reading this. The idea is that the ‘great winged snake’ that Summer describes isn’t just the wolf’s way of thinking of and describing a chimney or tower on fire but is instead a literal winged snake, a dragon. I find the idea that there was a dragon lying hidden beneath Winterfell to be thoroughly ludicrous but not as much as I find the notion that Martin, who spent one full book before letting Dany’s eggs hatch, would just sneak in an ice dragon (or whatever) into the final chapter of a character who barely spends more than a throwaway line on it. I’ve heard theories ranging from the sensible – it was a stone tower with smoke on its sides and something suddenly caught fire – to the absolutely insane – Rhaegar gave Lyanna a dragon egg and then the egg was buried with Lyanna in the crypts or something. I don’t think I’ve heard any substantial evidence suggesting that this snake was a dragon, but I’m willing to be convinced. One day when I come back I won’t know how to talk anymore. It seems that in the time since his ‘death’ Bran has become rather proficient at getting into and out of Summer’s head. We have known for a while now that Bran has had the ability unlocked, more so than any of his siblings but this is a remarkable improvement from the last time we saw him half a book ago. Yet, that good news comes with a warning – there is a danger, one that is repeated time and again, of Bran going in too deep, of him going in to the point of no return and being unable to come back out. For a while I thought that this would be unlikely after Bran met Bloodraven, since the latter could teach him enough about the green-sight and warging into the weirwoods but there’s no guarantee that Bran won’t somehow get so enthralled with what he sees in the past, or the future, that he might not be able to come back from it. If nothing else, the line above could be some grim foreshadowing. So on one hand, three days doesn’t seem absurdly, ridiculously long, but then you remember that this is three days without food, water or activity. Martin makes some mention of them pouring water down his throat and ‘smearing honey’ around his lips but let’s not kid ourselves – Bran should be on the verge of starvation at this point. Furthermore, very little mention is made of Bran feeling weak or drowsy during the rest of the chapter. This is either Martin not really wanting to harp on the whole ‘you’re going in too deep’ warging issue, or Bran’s mind has somehow yet to realize how very hungry the poor boy is. Some of the gargoyles had broken into so many pieces it made him wonder how he was alive at all. I’ve always wondered about this – was it magic that Bran survived with as little (relative) injury as he did? There isn’t anything that we’ve heard that would suggest that anything supernatural was at play but at the same time, any height tall enough that stone smashes into pieces upon impact is certainly enough to kill a human. Tinfoil time: what if that isn’t just a throwaway curse or expression of anger but instead full-on foreshadowing? Yeah, I don’t really think so either but let’s just go with it for a while and see what that would look like. In order for Osha’s curse to come true, the Wall would need to fall, the Others would need to sweep down South, the Boltons – specifically Ramsay – would need to fight the Others and the Others would need to kill Ramsay. Honestly, that doesn’t sound all that far-fetched now, does it? The Wall is definitely going down sooner or later and when that happens, it will likely fall to the Boltons to save the day. Wait, I hear you say, isn’t it fairly likely that Stannis is going to smash the Boltons outside Winterfell and show them what’s what? Why, yes, theoretical question asker, there is some evidence to suggest that. However, if you would put your extra strong tinfoil helmet on, I would like to remind you that there is a theory that Stannis becomes the new Night’s King and while I don’t really subscribe to that theory, I wonder if that wouldn’t count as the Others taking them that did this work? Ok, so seriously speaking, yeah, I don’t think it’s all that likely but there is definitely a sense that the Boltons will finally get what’s coming to them, at some point. Since we’re already talking theoretical matters this week, let’s think about how things would have turned out if Bran and Rickon had headed to one of the Stark bannermen. Of course, on hindsight, it would have made more sense if Bran went to White Harbour but without the benefit of hindsight, I can definitely see the wisdom in Osha’s suggestion. The main thing that would change would be that the world would know of the Bolton’s less than stellar loyalty record. Could the Red Wedding have been averted? Perhaps, perhaps not, but that’s a whole other depressing conversation. The stone is strong, Bran told himself, the roots of the trees go deep, and under the ground the Kings of Winter sit their thrones. So long as those remained, Winterfell remained. So, here we are, at the end of the book and at the beginning of Bran’s great journey north. Winterfell is officially a ruin now and even in A Dance With Dragons, it won’t be referred to as anything other than an inhabited ruin. Yet, as we can see above, there is some small seed of hope left behind; even though the castle was sacked and its people killed, the concept and legacy of Winterfell lingers on. I very much believe that we will see the Starks return to Winterfell before the series ends but whether or not that is a good thing remains to be seen. The result of this chapter, and this book really, is that the Starks have now lost their authority and the source of their strength. Without Winterfell, they can no longer claim to really be the leaders of the North in anything other than name. On a psychological level, it is pretty catastrophic for the King in the North to basically be a man without a home. At this point in the story, there is nothing for the Starks to return to; win or lose, they will have to find a way to recreate their lost legacy.